I'm so excited to be co-hosting an awesome link party this week. It's hostessed by two fantastic and I'm grateful that they let me join them this week. Follow your hostesses Katherines Corner, Sew Crafty Angel And Me, In the Kitchen with Jenny, let us know if you are a new follower. Hi Jenny! Thanks so much for co-hosting! Following you via GFC and Bloglovin'. Have a blessed week! Thank you for being our guest hostess this week. Big hugs and happy hopping! That would be awesome. I live too far. Maybe I need to plan a vacation! Thanks for guest hosting! Im following you on GFC, Bloglovin and Pinterest. Thanks for stopping by! This week has cooled down. Time to crank out the soups! Thanks for hosting Jenny! I am now following your blog in several ways. Have a good Thursday. Thank you for joining me Judy! Hi Jenny, Thanks for co-hosting a great party. There are so many new blogs to follow. Thanks for joining us Joanne! I am your latest follower. Thank you for co-hosting! Thank you Wendi for swinging by! Hi Jenny, so nice to meet you. It is good to see you on Favorite Things Thursday. Have a blessed weekend. New follower here! Hi, Jenny. Thanks for co-hosting Thursday Favorite Things blog hop! First time visiting your blog! Been checking out some of your posts and have to say, your recipes look so delicious! 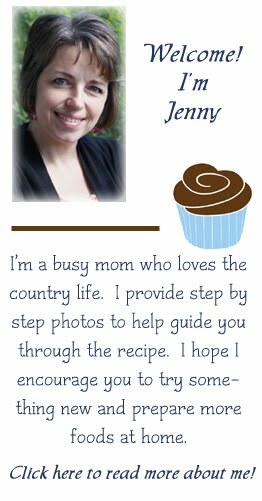 I am more of a crafter/decorator than a cook, but sometimes I get in a baking mood and I know where I can come for some great ideas!